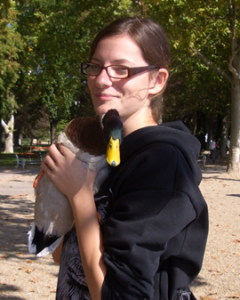 I’m a BSc student at University of Pannonia (Department of Limnology, Environmental Sciences). In my research we studied the breeding site fidelity of common terns (Sterna hirundo) in a breeding colony near Várpalota and now we try to locate the migration route of 5 individuals using geolocation. Ferincz, Á., Staszny, Á., Weiperth, A., Sütő, Sz., Soczó, G., Ács, A., Kováts, N., Paulovits, G. (2014): Data to the fish fauna of the wetlands in the southern shore of Lake Balaton. (in hungarian) Natura Somogyiensis 24: 279-286. Breeding site fidelity study of Common Terns (Sterna hirundo) with assessment of biotelemetry possibilities. (in Hungarian) TTD Student Conference, Biology section, Veszprém, (2nd prize) 2014. Sütő, S., Ferincz, Á., Liker, A., Szinai, P. & Preiszner, B. 2014. The breeding site fidelity and migration routes of Common Terns (Sterna hirundo) in Hungary. (in Hungarian) LVI. Annual meeting of Hungarian Hydrological Society, Tihany.